Chances are, if you read ads selling horses, or someone is telling you about the height of their horse, they will use the word "hands" to express the measurement. For example, a very tall horse might be 17 HH. 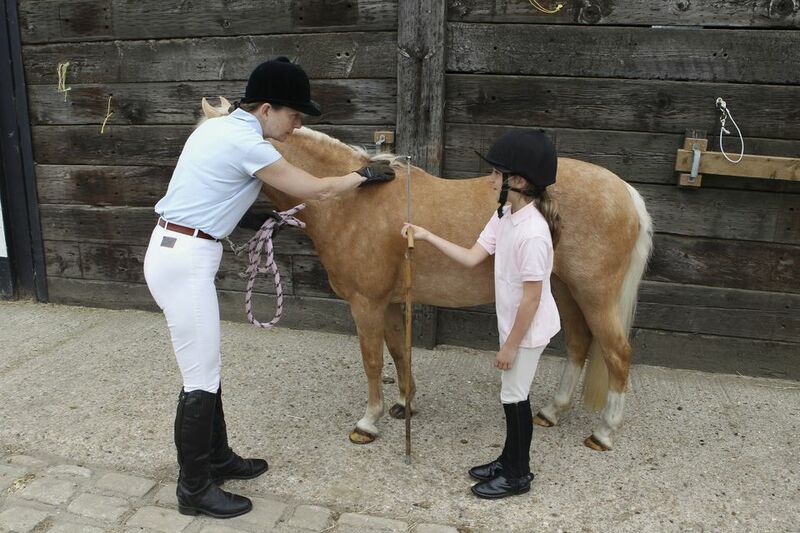 A pony is an equine under 14.2 HH. HH or H stands "hands high" or "hands." Hands is a measuring unit that has been used for several centuries. The measurement may, in fact, trace back to the Ancient Egyptians. A hand represents four inches or approximately the width of a male adult’s hand. However, horses are not exclusively measured in hands. In some countries and for FEI competition, horses are measured in centimeters. Ponies, miniature horses, and other diminutive equines may also be measured in centimeters or in inches rather than hands. When measuring in hands, partial hand widths are expressed in inches. So a horse that is 14.2 hands is 14 hands plus 2 inches. The total inches would be 58 inches. A horse could never be said to be 14.5 inches, as the number after the decimal is not a fraction, but represents an entire inch. If a horse is 14.2 1/2 HH, that means he’s two and one-half inches over 14 hands. Horses are measured from the ground, just beside and behind a front foreleg to the top of the withers or fifth vertebrae. This is the one part of the horse’s top line that does not change whether he lowers or raises his head or drops or arches his back. This is standard, regardless of what increments, hands, and centimeters or inches you use, what country you are in, what discipline your ride or breed of horse or pony. There are a few instruments that you can use to measure a horse’s height. The most accurate and easiest are to use a proper height measuring stick. This tall stick, marked with measurements, with a horizontal bar that slides up and down the stick. The stick is held alongside the horse, and the horizontal bar is slid down until it touches the horse’s withers. Some sticks have a leveling bubble, so you can be sure you are holding the stick level. Height tapes can be purchased inexpensively at feed or tack stores. The problem with tapes is that they are light and floppy, and are hard to hold taut enough to get an accurate measure. Someone has to hold the bottom against the ground, while another person eyes up the measurement at the horse’s withers. You can’t lay the tape against the horse. It must stay perfectly perpendicular to the ground. Often height tapes are printed with a weight tape on the opposite side. A regular tape measure can be used to measure height but comes with the same problems as the height tape. Additionally, metal tape measures make rattling noises horses sometimes object to, making it difficult to get the horse to stand still for a measurement. Probably, the easiest homemade measuring device is a piece of binder twine tied to a large metal nut or washer. The weight of the metal will hold the string steady, while the handler eyes up the withers and marks the twine—a magic marker will do the trick here. Then the length from the bottom of the washer to the mark on the twine is measured. Another trick is to use a yardstick, piece of lath or even a whip to make it easier to get a line from the twine to the withers. Just hold the yardstick so it is sitting on the horse’s withers, parallel to the ground and note where it hits the tape. To measure your horse, have him stand square on a level surface. Hold the tape or stick perpendicular to the ground and beside the horse even with the top point of the horse’s withers. If you are using a proper measuring stick, lower the bar, so it meets the top of the horse’s withers. Take note of the measurement. If you can only measure in inches, divide the inches by 4, and calculate the remaining inches. So, 62 inches would be 15 hands plus 2 inches or 15.2 HH. If height is the determining factor of whether your horse will compete in horse or pony events, you may have to take horseshoes into account. Shoes can easily put a ‘pony’ over the official height, and you need to find out if allowances are made for shod ponies. If you require a horse of a specific height or need to qualify a horse’s height, you’ll need to know if the measurement includes shoes or not.